We strive to maintain an accessible and inclusive environment for visitors of all abilities. The Festival is located on the National Mall between Twelfth and Fourteenth streets, and is accessible via concrete sidewalks and/or packed gravel walkways. The majority of the venues are located in the shaded, grassy areas of the Mall. The Smithsonian Accessibility Map outlines accessibility features throughout the Smithsonian campus. Accessible seating is available at all performance venues. A limited number of wheelchairs and folding cane-chairs are available for loan each day at the Volunteer Tent. If you regularly use a mobility device, particularly when traveling longer distances, we recommend that you bring it with you. There are accessible portable toilets located throughout the Festival grounds (all toilets are gender neutral). Companion care/family restrooms are located in the National Museum of American History, National Museum of Natural History, and the Arts and Industries Building located nearby. Service animals are welcome, and water stations are available throughout the site. American Sign Language interpreters and Real-Time Captioning services are available for select performances and presentations. Additional ASL interpreting services may be requested and are provided as available. Please visit the Volunteer Tent for more information. See lists of all events with ASL interpretation and Real-Time Captioning services on the schedule. All narrative stages and performance venues are equipped with assistive listening systems. Receivers may be obtained from a Festival volunteer or staff member at each venue. See a list of all events with assistive listening devices available on the schedule. Sighted-guide and verbal-description services are available upon request for visitors who are blind or low-vision. Live Audio Description is available for select events. Please visit the Volunteer Tent for more information. See a list of all events with audio description provided on the schedule. Large-print and Braille brochures are available at the Volunteer Tent and Information Booths. Large-print and Braille menus are available at concession stands. Details about the Festival layout and sensory information can be found in the Festival Sensory Guide. Food allergen information for products sold in the concessions stands is available upon request from each vendor, or by visiting the Volunteer Tent. Information regarding these and additional accessibility services can be found at the Volunteer Tent and will also be updated here throughout the Festival. To request any other access services not mentioned above, please call (202) 633-2921 or email access@si.edu. Basque stone carver Bernat Vidal guides a visitor at the 2016 Festival. 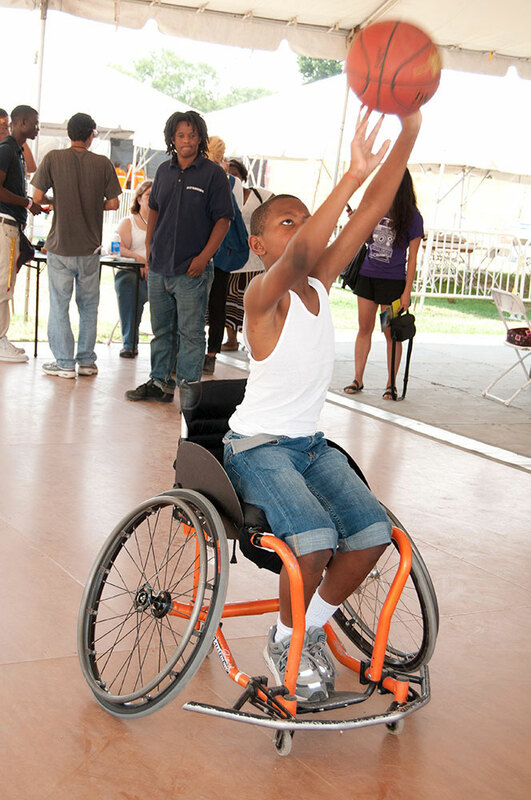 At the 2012 Festival, representatives from Indiana University hosted rounds of wheelchair basketball. An American Sign Language interpreter stationed at a stage in the NASA program at the 2008 Festival.